You are currently browsing the tag archive for the ‘Rob Bell’ tag. Eugene Peterson (1932- ) was for many years James M. Houston Professor of Spiritual Theology at Regent College. He also served for 35 years as founding pastor of Christ Our King Presbyterian Church in Bel Air, Maryland. Today he is retired and lives in Montana. In fact, it IS a novel! It was translated by Peterson and reviewed by 21 “consultants” from the following schools: Denver Seminary (Robert Alden), Dallas Theological Seminary (Darrell Bock and Donald Glenn), Fuller Theological Seminary (Donald Hagner), Gordon-Conwell Theological Seminary, Trinity Episcopal School, North Park Theological Seminary, Trinity Evangelical Divinity School (Richard Averbeck). Columbia Bible College, Criswell College (Lamar Cooper), Westminster Theological Seminary (Peter Enns), Bethel Seminary (Duane Garrett), Southern Baptist Theological Seminary (Paul R. House), Covenant Theological Seminary, Westmont College, Wesley Biblical Seminary, Reformed Theological Seminary, Moody Bible Institute (John H. Walton), Austin Presbyterian Theological Seminary, and Gordon College (Marvin Wilson). The Message is widely recommended by well-known Christian leaders. In keeping with his love for every corrupt Bible version to appear since the Revised Standard, Billy Graham printed his own edition of “The Message: New Testament.” Warren Wiersbe, who should know better, says, “The Message is the boldest and most provocative rendering of the New Testament I’ve ever read.” Jack Hayford says, “The Message is certainly destined to become a devotional classic — not to mention a powerful pastoral tool.” Rick Warren loves The Message and quotes it frequently, five times in the first chapter of The Purpose-Driven Life. J.I. Packer says, “In this crowded world of Bible versions Eugene Peterson’s blend of accurate scholarship and vivid idiom make this rendering both distinctive and distinguished. The Message catches the logical flow, personal energy, and imaginative overtones of the original very well indeed.” CCM artist Michael Card says, “Peterson’s translation transforms the eye into an ear, opening the door of the New Testament wider than perhaps it has ever been opened.” Leighton Ford says, “The Message will help many to transfer God’s eternal truths to their contemporary lives.” Joni Earckson Tada says, “WOW! What a treasure The Message is. I am going to carry it with me. This is a treasure that I will want to use wherever I am.” The Message is also recommended by Amy Grant, Benny Hinn, Bill Hybels, Bill and Gloria Gaither, Chuck Swindoll, Toby of DC Talk, Gary Smalley, Gordon Fee, Gordon MacDonald, Jerry Jenkins, John Maxwell, Joyce Meyer, Kenneth Copeland, Max Lucado, Michael W. Smith, Newsboys, Phil Driscoll, Rebecca St. James, Rod Parsley, Stuart and Jill Briscoe, Tony Campolo, Bono of U2, Vernon Grounds, to name a few. (This information was gathered from the NAVPress web site.). The Message sold 100,000 copies just in the first four months following its summer 1993 release. Peterson has also recommended Rob Bell’s universalistic book Love Wins. Bell says hell is in this life and most men will eventually be saved. He writes: “This insistence that God will be united and reconciled with all people is a theme the writers and prophets return to again and again. … The God that Jesus teaches us about doesn’t give up until everything that was lost is found. This God simply doesn’t give up. Ever” (Love Wins, Kindle location 1259-1287). 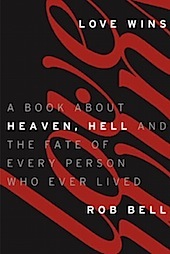 Bell calls the preaching of eternal hell “misguided and toxic,” a “cheap view of God,” and “lethal” (location 47-60, 2154-2180). He says there is something wrong with this God and calls Him “terrifying and traumatizing and unbearable” (location 1273-1287, 2098-2113). That kind of talk apparently resonates deeply with Peterson. No wonder he loves the non-judgmental god/goddess of The Shack. Peterson is a big promoter of Catholic contemplative mysticism. He is on the Board of Reference for the international ecumenical contemplative organization Renovare (pronounced Ren-o-var-ay, which is Latin, meaning “to make new spiritually”), founded by Richard Foster. At the October 1991 Renovare meeting in Pasadena, Foster praised Pope John Paul II and called for unity in the Body of Christ through the “five streams of Christianity: the contemplative, holiness, charismatic, social justice and evangelical” (CIB Bulletin, December 1991). Foster advocates the practices of Catholic mystics and “the integration of psychology and theology.” In his book entitled Prayer Foster draws material from Julian of Norwich, Thomas Merton, Bernard of Clairvaux, Madame Guyon, Teresa of Avila, even St. Ignatius of Loyola, the founder of the Jesuits. Renovare promotes guided imagery, visualization, centering prayer, astral projection, Zen meditation, and Jungian psychology (Calvary Contender, Feb. 15, 1998). Along the same line, notice the heroes of the faith that Peterson quotes in the article “Spirit Quest” (which is a Native American Indian term for seeking intimacy with and revelation from pagan spirits): “Single-minded, persevering faithfulness confirms the authenticity of our spirituality. The ancestors we look to for encouragement in this business — Augustine of Hippo and Julian of Norwich, … Teresa of Avila — didn’t flit. They stayed” (Christianity Today, Nov. 8, 1993). Augustine, Julian, and Teresa had authentic spirituality? Not when tested by Scripture. Julian of Norwich said, “God showed me that sin need be no shame to man but can even be worthwhile” (quoted by Kenneth Leech, Soul Friend, p. 146). Julian also said, “God is really our Mother as he is our Father,” and called Christ “Mother Jesus.” Augustine was the father of a-millennialism; taught that the sacraments are the means of saving grace; was one of the fathers of infant baptism, claiming that baptism takes away the child’s sin; taught that Mary did not commit sin and promoted prayers to her; believed in purgatory and the veneration of relics; accepted the doctrine of celibacy for “priests”; and laid the foundation for the inquisition; to name a few of his heresies. Teresa of Avila was probably demon possessed; she levitated and made strange noises deep in her throat, experienced terrifying visions and voices, and held to Rome’s sacramental gospel that works are required for salvation. Peterson was Professor of Spiritual Theology at Regent College, and it is obvious that he has been influenced deeply by the Catholic and pagan “spirituality” in which he has immersed himself for so many decades. I have spent many days studying in the Regent College library and the bookstore features many works by Catholic mystics, such as those already named, as well as by rank theological modernists. There is no warning whatsoever in regard to these books. The mystical “spirituality” that is so popular in evangelical and charismatic circles today is a yearning for an experiential relationship with God that downplays the role of faith and Scripture and that exalts “transcendental” experiences that lift the individual from the earthly mundane into a higher “spiritual” plane. Biblical prayer is talking with God; mystical spirituality prayer is meditation and “centering” and other such things. Biblical Christianity is a patient walk of faith; mystical spirituality is more a flight of fancy. Biblical study is analyzing and meditating upon the literal truth of the Scripture; mystical spirituality focuses on a “deeper meaning”; it is more allegorical and “transcendental” than literal. Peterson defines spirituality as “a fusion of intimacy and transcendence” (“Spirit Quest,” Christianity Today, Nov. 8, 1993). This confuses the sensual intimacy of earthly relationships with the spiritual intimacy the believer has in this life with God. It is not surprising that Peterson’s translation has a New Agey flavor to it. He even uses the term “as above, so below,” which is a New Age expression for the unity of God and man, Heaven and earth. In the book As Above, So Below, Ronald Miller and the editors of the New Age Journal say: “This maxim implies that the transcendent God beyond the physical universe and the immanent God within ourselves are one. Heaven and Earth, spirit and matter, the invisible and the visible worlds form a unity to which we are intimately linked” (quoted from Warren Smith, Deceived on Purpose: The New Age Implications of the Purpose-Driven Church, Ravenna, Ohio: Conscience Press, 2004). Comment: Being poor in spirit is to be at the end of your rope? Then vast numbers of unsaved people are candidates for heaven on this basis. Comment: This must be transcendental, because it doesn’t make any non-transcendental sense. Comment: “God-colors”? I didn’t even learn about God-colors when I was a member of Parmahansa Yogananda’s Self-Realization Fellowship Society before I was saved! Comment: The Message sounds like an iron tonic television commercial here! Comment: The Message gives an Anti-Trinitarian, Jesus-only spin to this verse, which teaching claims that God is not three Persons in one Godhead but that He simply manifests Himself in three ways. Comment: To translate “the only begotten Son” as “this one-of-a-kind God-expression” is not only heretical; it is absurd. Comment: Peterson’s “translation” gives the baptismal regenerationists the best support they have ever had. The Roman Catholics who write to debate me would love this version. Comment: To add to the words of Christ in this strange manner, it truly appears that Peterson has no fear of God. Comment: Since Peter cussed some the night he denied his Lord, I suppose Peterson believes he was still cussing in the book of Acts. Comment: Peterson spiritualizes Christ’s resurrection here. Comment: Revelation 22:18-19 should cause Peterson (and everyone who approved The Message) to lose a lot of sleep. Comment: It is the “translator” who is squinting in a fog! Comment: This is another New Agey, heretical spin to the Scriptures. Comment: What? And this mess was reviewed by 21 scholars and approved by the likes of J.I. Packer? Comment: Peterson has done away with wifely subjection. Do we have the “feminist version” here? It is O.K. to Dabble in Heresies? Mark Galli, senior managing editor of Christianity Today, says that evangelicals should be allowed to dabble in heresies. He said this in the context of Rob Bell’s heresy-packed book Love Wins. Though Bell denies the infallible inspiration of Scripture, Christ’s substitutionary atonement, the necessity of being born again through personal faith in Christ, eternal hell fire, and other cardinal doctrines, Galli claims that he is “a brother in Christ” and that we should be patient with his errors. According to Galli, we should treat Paul Young and The Shack with the same “charity.” He says, “We recognize that an author trying to repeat the old, old story in fresh ways will sometimes overstep the bounds of traditional theology” (“Rob Bell Is Not a Litmus Test,” ChristinaityToday.com, May 5, 2011). This is a recipe for spiritual shipwreck. The Bible warns God’s people to mark and avoid those who teach doctrine contrary to the apostolic faith, because false teachers are able to deceive the hearts of the simple (Romans 16:17). Heretics are to be rejected after the first and second admonition (Titus 3:10-11). Doctrines of devils are not to be entertained; they are to be refused (1 Timothy 4:1-7). No, the fact that so many resonate with Bell’s heresies is evidence of the wholesale compromise of evangelicalism and is a loud warning that we should touch not the unclean thing lest we, too, be polluted. Separation is a fundamental biblical practice. “Zeal will make a man hate everything which God hates, and long to sweep it from the face of the earth” (J.C. Ryle, 1816-1900). LOVE WINS, A Book About Heaven, Hell, and the Fate of Every Person Who Ever Lived.